The alliteration was too good, I had to! So, today I wanted to post about a good friend of mine named Margaret. However, I got stuck on how to highlight Margaret because I wasn’t sure how to do her justice. You see, Margaret completed her first FULL marathon two weeks ago. That’s right 26.2 grueling, sweat-filled miles of pavement pounding to accomplish a goal she had since 7th grade! Thinking about Margaret checking this off her “bucket list” is truly amazing! I wanted to highlight her “wholehearted wellness” for obvious reasons, but then it hit me how motivating Margaret’s marathon is because at any point she could have quit training, said it was too hard, or stopped at the half marathon point and said this is good enough (she joked this was her plan two weeks leading up to the race, but I knew better). Margaret had a goal: complete a marathon. Margaret’s goal was not to try really hard or get half way there, she wanted to complete a full marathon and check that off her bucket list. In order to accomplish that she had to set a goal, develop a plan, follow through, and stay motivated. This is what is most impressive about her accomplishment; she set a goal and followed through! Margaret had her outcome goal all along: finish a marathon. Outcome goals are the main source of motivation for most individuals. They are what we desire to attain. Lose 10 pounds, run a marathon, learn a new language, all examples of outcome goals. However, it’s the process goals that are tricky! Process goals are the short-term objectives used to reach the outcome goal. They are the daily grind, the action steps that help you get there, but let's be real they are the hardest part. For instance, if your outcome goal is to lose 10 pounds, then the daily steps of choosing fruit over ice cream, or working out versus TV watching, are the process goals. Generally speaking, that is where most of us struggle. I know I do for sure! Process goals can be boring and where we get discouraged. We may even take for granted how the process is connected to the outcome! Margaret didn't, she had to log 15-20 miles a week in order to meet her goal of finishing a marathon, which is truly impressive! Margaret did two more things I think are important to highlight when goal setting, which is finding intrinsic motivation and building in reward systems. Intrinsic motivation is when we are motivated to do something we desire to do for ourselves without external rewards, such as praise or money. I can tell you Margaret didn’t run a marathon to get featured in a blog post that 5 of my friends may read! She did it because it was something she wanted to accomplish for herself. That’s why she was successful. This is a great reminder to encourage myself and others to dig within when setting goals! Finally, she built-in rewards! Margaret recently told me her husband, Alex, ran the last 9 out of 10 miles with her, and they celebrated at the end of each mile in order to stay motivated. First of all, can we all find an Alex for our lives? Seriously though, building in rewards can be extremely beneficial to accomplishing a goal. As silly as it may seem, Margaret had a reward every mile, she got to do something fun and supportive with Alex as she checked off one more mile. She was able to get an extra boost of heck yes if you will! I think that’s key. We all need an extra bit of heck yes when we’re trying to reach a goal. It’s when we don’t have those moments we tend to forget the joys that will come when we reach the outcome and fall off the process. I bet Margaret would say if she didn’t have the encouragement from Alex motivating her at the end of those miles it would have been a lot harder to finish! 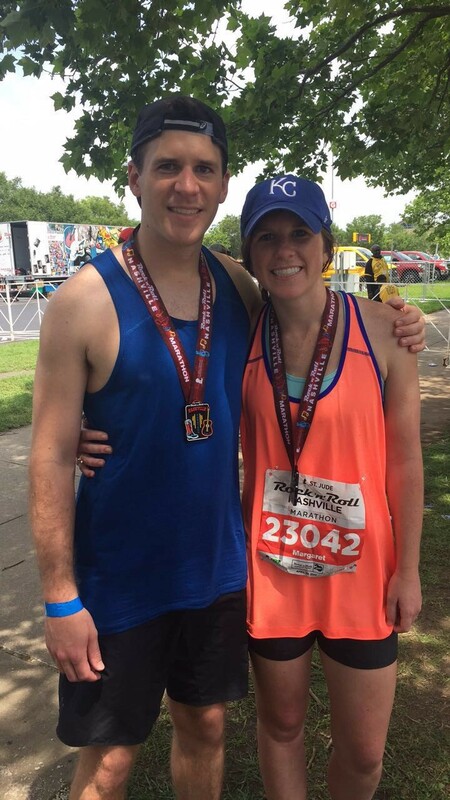 Those built in rewards helped her keep the course and become a marathon finisher! Build in rewards to your process goals and find the heck yes moments that boost you to finish too! Margaret’s marathon accomplishment really is a testament to her as a person. She is a wholehearted, healthy, and more than happy individual! Her story was a great reminder on the process of setting and following through on goals. It’s easy to forget there is a process. Social media can trick me into thinking I should be the most in shape, fit, and fabulous person on the planet, but then people like Margaret remind me of the true grit and follow through that is behind the process. This is why I think we all benefit from a little Margaret Motivation! Congrats on your achievement, Marge! If you're struggling with reaching or setting your own goals, then that is where I’d love to help! Please comment below with any feedback or questions you may have, or if you are interested in a counseling session give me a call (479) 308-5495!